This week, The Past Present again decided to investigate a snapshot of Sydney’s Industrial History. Many of the black and white photos in the collection, all from circa 1936 and by an unknown photographer, show industrial sites in Sydney and other cities along the Australian East Coast. 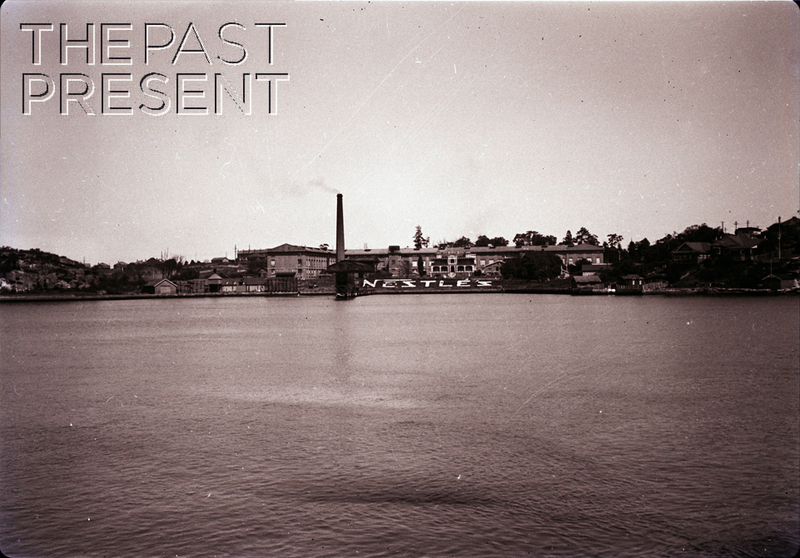 Today we are focussing on the image above, showing the old Nestles Factory at Abbotsford on the Parramatta River. If you look closely, in the centre of the photo there is an ornate old house amongst the factory buildings. This is Abbotsford House which was built between 1877 and 1878 for Dr Arthur Renwick and it is this house from which the suburb of Abbotsford takes its name. The property eventually passed to Albert Edward Grace, one of the founders of Grace Bros, who sold the property to Nestles in 1917. The property was not just a house though. It included orchards, sporting fields, a boatshed and a large pavilion which had been built by the Grace family. This pavilion was the original site of Nestles production at the site while Abbotsford House served as an administrative office. A purpose built factory was constructed around the house between 1918 and 1920. Being located on the Parramatta River, the factory could easily be supplied with their raw materials, including coal. These products were delivered by boat to the factory jetty, and from there were transferred to a specially built narrow gauge tramway and then to the various storerooms and boilers. Although the factory was most famous as the home of Nestles, producing their famous milk products and chocolate, it also served other, more surprising, roles in Australian history. In 1927 the grounds and riverfront were used to shoot scenes for the Australian film For The Term Of His Natural Life and later, in World War II the factory turned to packing supply rations for soldiers serving on the Kokoda Track. The factory closed in 1991 with the factory buildings being demolished and replaced by housing, while Abbotsford House survived the destruction, being preserved and restored. Today it is again a private residence. This entry was posted in New South Wales, Sydney Suburbs and tagged 1930s, black and white, buildings, commerce, industry, military, photographic collection, rivers.